The hotel was going through renovations, but it did not affect us whatsoever. The workers cleaned up after themselves and there was no noise or smell due to the construction. We all enjoyed the complimentary cookies at the front desk. Great hotel! I enjoyed the comfort of the beds and the cleanliness of the rooms. I enjoyed all of it. I had no complaints. Customer service and hotel standards are exemplary every time I visit this location. Special "Evolution beds" are extremely comfortable! We reported the squeaky bathroom door to the staff but it was not corrected before we departed. Otherwise, this would have been excellent trip. Enjoyed the peace and quiet and friendly staff. The 224-room Hilton Garden Inn Orlando at SeaWorld International Center is located in the International Drive resort area and provides quality accommodation equally suited to families on vacation or the business traveler. Items included with the room rate at this full-service hotel are transportation to Orlando's three most famous attractions, Walt Disney World, Universal Studios and SeaWorld, high-speed Internet access, local telephone calls, a copy of USA Today and parking. There is 4,400 square feet of space available for business or social functions. Area landmarks and attractions include numerous golf courses, the Orlando Convention Center, Aquatica Water Park, Discovery Cove, the Florida Citrus Bowl, Amway Arena, home of the Orlando Magic basketball team and shopping at the Prime Outlet Shopping Mall, Fashion Square Mall and the Florida Mall. Rooms come with a choice of two double beds or one king size bed. All rooms have a refrigerator, microwave oven, 25-inch remote controlled television with news and cable channels and pay-per-view movies and video games, coffeemaker, work desk with ergonomic chair and high-speed Internet access, two dual-line telephones with dataport, alarm clock-radio with MP3 connectivity, iron and ironing board and a hairdryer. This hotel has an outdoor heated swimming pool, Jacuzzi and a fitness center. The on-site Great American Grill serves breakfast, lunch and dinner. Room service is available in the evenings. Sting Ray's Lounge has nightly drink specials and live entertainment. The Pavilion Pantry is always open and has snack items, beverages and sundries. 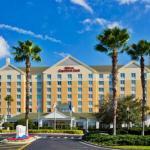 The 24-hour front desk has safe deposit boxes and information on the Orlando events and attractions. Other amenities include a business center, guest laundry, daily housekeeping and ice and vending machines. The adjectives awesome, friendly and convenient were used by guests who stayed at this Hilton Garden Inn. Many enjoyed the short walk to SeaWorld and appreciated the complimentary shuttle to see Mickey and his friends at the Magic Kingdom. There were complements for the cheerful crew of employees and most clients said they had no hesitation in recommending the property to others and said they would stay here themselves on future visits to Orlando.